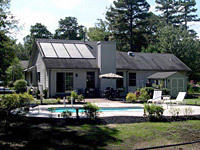 Solar Pool Heating Testimonials | Solar Living, Inc. Thank you so much! The best thing we could have done to our pool. Don't really know why we waited SO long to do it!! Thank you so much. You guys are the best. We have enjoyed our pool so much with the solar heating system. I hate when summer ends. Its so depressing. Well, hope you all have a nice safe winter - enjoy all your holidays. Thanks for your prompt service on the recent repair. System works great and has saved us a lot of money over the years. We have been using the solar system every day possible since we opened the pool. Our pool was 91 degrees last Tuesday (5/29/12) and 90 degrees yesterday. Even though today is not the nicest the pool is still 85 degrees. We love the system and recommend it highly. Thanks again! Hello, Just wanted to let you know my solar panels are working well, and my gas bill this month was $300 less than the same time last year! I was very pleased with the company that did the work--they are called Solar Living, office number 973-691-8483 or capturethesun.com. If you have other customers interested in doing this, I highly recommend this company. You may recall that I asked about morning water temperature. I had in mind swimming at the crack of dawn. It turns out that temp differential comes into play. In the morning, the pool is never below 78 (usually 80 +) and the outside temp is less than this. The result is a nice warm 6am swim. This is a definite bonus. These panels are just wonderful! Thank you so much, it was a pleasure doing business with your company. We are all enjoying our pool so much more this year, it has made a huge difference in how often we go in! Thanks again! I have been meaning to drop you a note for several months now, to let you know how happy Bob and I are that we decided to go with a solar pool heating system installed by Solar Living when we had our inground pool installed last summer. My brother had already done business with your company and highly recommended you and we’re glad he did. As you probably hear from many customers, there are usually many headaches associated with a pool project and ours was no exception. However, I have only good things to say about Solar Living. First, your web page is excellent. Next, you personally returned phone calls quickly whenever I had any questions. During the initial visit your representative showed up on time, was neat and professional, thoroughly explained the system needed for our pool, and only a few days later submitted a detailed proposal. Then the installers showed up. They were on time, neat and professional, completed the job as promised and cleaned up. There were no hidden or unexpected costs involved. Painless every step of the way! In the beginning our only concern was that the panels would be an eyesore. We were able to have them put on the back side of the roof which actually faces south and still get the desired effect - warm as we wanted pool water. Turns out the black panels on the black roof are hardly noticeable. Here’s a photo of the completed project - We’re still working on the lawn. Oh and I almost forgot, we really, really loved our warm pool water, especially evenings in September when other pool temps dropped below 70. We are counting the days to pool opening. Just wanted to let you know how happy we are with the solar heat and the job you did with the installation. Even with the limited amount of sun we have had since the installation the pool has gone from the low 60's to the mid - upper 70's. I'm also amazed that even on cloudy (overcast) days there is still enough sun and heat that gets to the panels to keep the pool heated. The kids have been able to enjoy the pool while the neighbor's pools are still too cold. Best part is basically no added cost to getting it there. I need to swim for medical reasons as often as possible. I can't begin to tell you how happy we are with the solar pool heating system you installed this summer for us and how good it has made me feel. Turned the controls on the system up all the way to see how warm we could get the pool. Finally had to turn the temperature back down when the pool reached 93 degrees. I wanted to let you know how pleased my wife and I are with the solar panels that you installed for us a few years ago. As you know the summer of 2000 was cooler than normal, but with our solar panels we were the only ones in our neighborhood that not only opened our pool, but were swimming comfortably in 86 degree water, from May through October. Our neighbors are astounded that we have such a warm pool so early and so late in the season. My wife and I have determined that our pool is not suitable for swimming if the temperature is below 78 degrees. Before installing the solar panels we could use the pool only an average 30 to 45 days a year, now we can use the pool 71 to 80 days a year and open the pool earlier in the season. The best part of having the solar pool heating system is that each evening when I come home from work the pool is already warm and waiting for me. You have no idea how great it is to jump in for 5 to 10 minutes each night after a long day at work. I previously only swam on the weekends because I couldn't justify the expense of turning the gas heater on during the week. Please schedule a visit to remove our gas pool heater for us. Ever since you installed the solar pool heating system (6 years) we have not used the old gas heater even once. Since it is just taking up space we'd like to have you remove it.